“Because of our growing and ageing population, I’m asking you to join us in a campaign for a Public Hospital in Forster / Tuncurry, it is important we garner support so that we can demonstrate to the Sydney Health Bureaucracy that we are united in protecting our families and friends” Steve. To the Honourable the Speaker, Premier and Members of the Legislative Assembly of New South Wales. 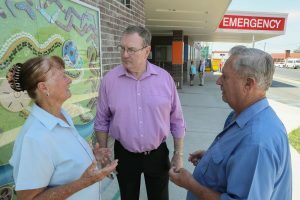 This Petition of residents of the Myall Lakes electorate, calls on the Government to build a Public Hospital in the Forster / Tuncurry area to provide an emergency department, medical imaging, ambulatory care and inpatient units to over 20,000 residents who call the Great Lakes home. The undersigned petitioners therefore ask the Legislative Assembly to commit funding for the construction of a Public Hospital for our community.